The scene backstage after the July 19 show was one of subdued excitement. Many of the folks in the green room had already seen one or more of the reunion shows, and were just enjoying the afterglow. Eddie Izzard, who had just seen his sixth show was at the bar, apparently being interviewed. It was his first time as the onstage celebrity during the Blackmail sketch, though, and he seemed to have really enjoyed his time up there with the Pythons. After a few minutes, Terry Jones entered the room, and made a beeline to my son and me.We discussed the show, and Terry again marveled at how their audience just lifted them up and made it such a special event. 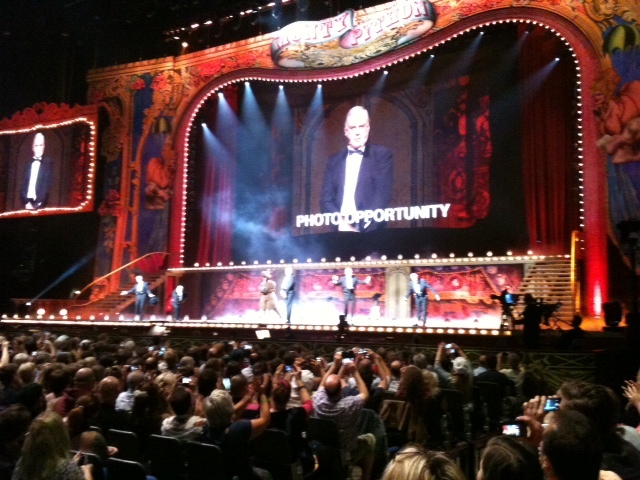 Not long after, John Cleese entered and headed straight for us. I secretly enjoyed noticing that Eddie Izzard watched both John and Terry make a point of greeting me immediately, and he seemed to decide that I was someone worth noticing… Eddie joined us, and he gave John a couple of suggestions (undoubtedly solicited by John) about a couple of moments. I asked John if, during a couple of moments when lines were shaky, he had done what he had done in other live shows–leaning over and asking the audience “What’s the next line?” He said that no, he hadn’t, but might well utilize it the next night if the situation arose. The rest was a blur. 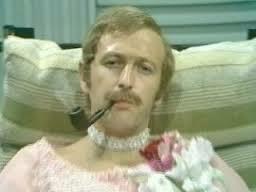 Terry introduced me to Ian Davidson, a familiar name to Python fans but someone I had never before met. Carol Cleveland walked through the room in showgirl costume, too far for me to get her attention. 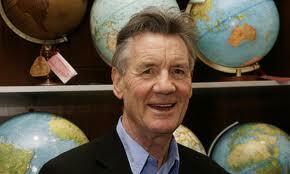 Michael Palin came over and said hello, and we were able to catch up for a few minutes. Then he begged off, explaining that they had to do a meet and greet, and I told him that John had invited us along if that was okay. He was very happy to have us along, and so our group, the five Pythons and a few of us stragglers, tailed by a camera crew, made our way through the hallways of the O2, and finally came to a freight elevator. 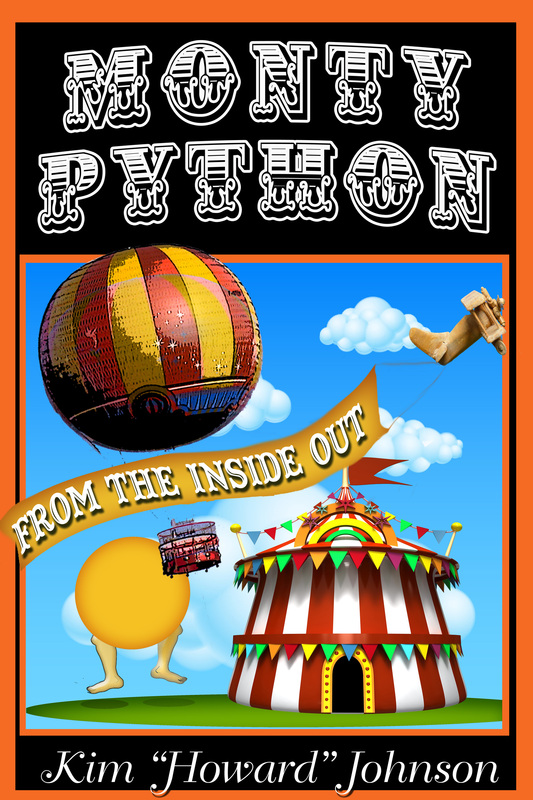 We all piled in–the five Pythons, my son and I, Eddie, their manager, the promoter, the camera crew, and a couple of other miscellaneous folks, all crammed inside. I think we went up several floors, though we may have descended–I’m not really sure, that’s how crowded and hectic it was. We got off in a large darkened storage area and headed toward what turned out to be a working pub crammed with fans who had opted for the meet and greet opportunity. While the Pythons were being miked, Eric Idle noticed me for the first time, greeted me warmly, and asked how my little boy was. I pointed out that the young man towering over both of us was the little boy that he had remembered. They entered the room to a rousing response, and fans who had literally come from around the world. They asked questions and Eddie moderated, and all seemed to have a great time. After about a half hour, the Pythons and the rest of the group headed back the way we came, down the elevator, and back to the bowels of the O2. Terry offered us a ride back to our bed and breakfast, which we gratefully accepted, and we had a drink in the Family Reception Room while he ran back to his dressing room for his bag. As we rode back to North London, Terry explained that after the first show, as an experiment and at their promoter’s behest, they did an extensive meet and greet with fans, posing for photos and signing autographs. Unfortunately, it took them over two hours, and they were totally exhausted afterward, so from that point on, they did the up-close-and-personal Q&A sessions instead–otherwise they’d probably have been too exhausted to make it through the weeks of shows. I asked question after question–after all, we hadn’t seen each other in nearly five years–but it wasn’t long before the adrenalin wore off, and we were all longing for bed. We thanked Terry again as the car pulled up in front of our inn, and promised we’d see him tomorrow night for the Last Night of Python. This entry was posted in Monty Python, Uncategorized and tagged Carol Cleveland, Eddie Izzard, Eric Idle, John Cleese, Michael Palin, Monty Python, Monty Python Live, Terry Jones on August 5, 2014 by howardjohnson1985.